Since the night of the Influence spell, Krissa has changed. She's doing her best to live a normal life, but it gets more difficult every day as the energy inside her grows and becomes harder to control. Will she win the fight against the darkness within her? Or will it overwhelm her and turn her into someone she's not? This is not a stand alone book - you must read the preceding books to understand the story line. 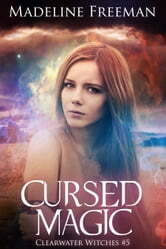 Cursed Magic picks up a little while (a month or two) after Moon Magic ends. The book continues writing from the different perspectives of three of the main characters - Krissa, Fox and Brody (who we were introduced to in the last book). Without posting spoilers you will be waiting to see how Krissa deals with the Influence inside of her - will it take her over? And like all good stories, there is a love triangle that will leave you wondering what is actually going on! There is a big twist towards the end that will leave you hanging for more!